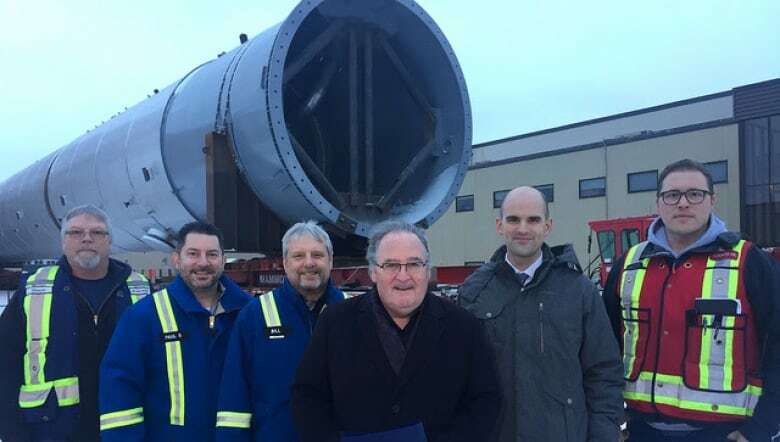 The Alberta government calls the 820-tonne, 96-metre-long piece of petrochemical development equipment the “heaviest load ever to travel on Alberta’s highway network." A massive piece of equipment — the size of a CFL football field and the heaviest ever to move on an Alberta highway — is slowly creeping its way toward Fort Saskatchewan. The huge piece of equipment will crawl through the capital region over the next four days, and its journey north is expected to cause headaches for commuters on city streets and area highways. The splitter is being transported from an industrial yard in the city's south side where it was built, to Inter Pipeline's $3.5 billion petrochemical development project, the Heartland Petrochemical Complex near Fort Saskatchewan. The rig began its four-day crawl Sunday night. Around 8 a.m. Monday, the rig was spotted on Highway 14 at a staging area on the east side of Highway 21. The Alberta government calls the propylene-propane splitter, equipment for petrochemical industry, the "heaviest load ever to travel on Alberta's highway network." The "historic super load" is six times as large as Caterpillar's largest mining truck used in the oilsands, the government said. The 800,000-kilogram piece of equipment is 96 metres long, Inter Pipeline said in a news release Sunday. The splitter separates propylene from propane, which is then processed into a recyclable plastic known as polypropylene. It will be moving slower than the speed limit and may be pulled over periodically, the government said. The load will use the entire width of a two-lane highway, including the shoulder. At its largest configuration, including all vehicles, the load is 179 metres long, 9.5 metres wide and 13 metres high. Exit Dacro Industries yard, west of 93th Street to 51st Avenue. East on 51st Avenue to Roper Road, continuing east to 75th Street. South on 75th Street to 51st Avenue. East on 51st Avenue to 50th Street at Whitemud Drive, westbound off ramp. Whitemud Drive east to Anthony Henday Drive southbound. Southbound on Anthony Henday Drive to Highway 14. East on Highway 14 to staging area on the east side of Highway 21 and the south side of Highway 14. East on Highway 14 to Range Road 190. North on Range Road 190 to Township Road 510. East on Township Road 510 to Highway 834. North on Highway 834 to Highway 15. West on Highway 15 to Lamont. Continue west on Highway 15 to Range Road 220. Head north on Range Road 220 to site, north of Fort Saskatchewan. Once installed later this year, the tower will be taller than the ski jump used at Canada Olympic Park in the 1988 Olympic Winter Games, Inter Pipeline said. Once complete in late 2021, the Heartland Petrochemical Complex is scheduled to be Canada's first integrated propane dehydrogenation and polypropylene facility.